An increase in publicly available data can often help our understanding of the sport. The rollout of Statcast data has been fascinating. Learning how hard Giancarlo Stanton hits a ball, how fast baserunners and fielders move to steal bases and make catches, and how hard outfielders and catchers throw the ball is all very interesting information. Up to this point, it can be tough to determine if the information is useful or if it is more akin to trivia knowledge, like batting average on Wednesdays or pitcher wins. An examination of the batted ball velocity against pitchers provides some hope of providing potentially important information, but until we have more data — and more accurate data — conclusions will be difficult. Looking at the top of the leaderboard in exit velocity, it is easy to see why linking a low exit velocity with good performance is enticing. I looked at all pitchers with at least 150 batted balls in the first half and 100 batted balls in the second half. Here are the top-five pitchers in batted-ball exit velocity this season, per Baseball Savant, along with their ERA and FIP. Looks like a pretty good list with some of the very best pitchers in baseball on it. Here are the next five. The above charts only contain ten pitchers, and Madison Bumgarner, Johnny Cueto, Michael Wacha, and Shelby Miller are all among the next group of pitchers, but Chris Archer and Gerrit Cole are both in the bottom 20 of exit velocity. That does not make the data useless, but making conclusions is going to be difficult when trying to determine if there are outliers or if the data is simply more random than we would like to see. To get a better sense of what’s going, I separated this season’s starting pitchers into three groups: those whose average exit velocity on batted balls is under 87.5 mph (21 of 91 pitchers), those whose exit velicoty sits somewhere between 87.5 mph and 89.2 mph (constituting 51 of 91 pitchers), and a final group of 19 pitchers who’ve allowed an average batted-ball exit velocity greater than 89.2 mph this season. 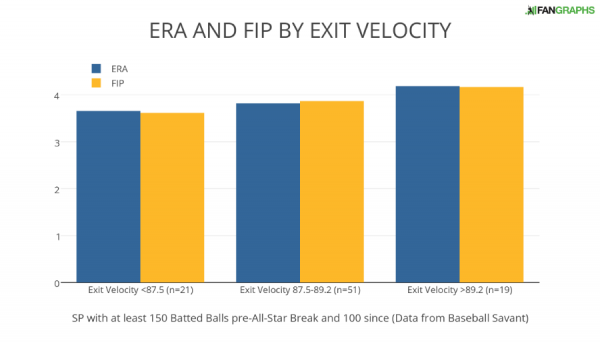 The initial analysis appears to show some effect on ERA and FIP depending on the batted ball velocities. There is roughly a half-run difference between the high and low groups, with the middle group falling squarely in between. There looks to be a bit of a difference between the two groups. We, or at least I, would assume that there would not be a great relationship between exit velocity and individual pitcher ERA or FIP given how many other variables go into determining those statistics. Given that, an r of .33 for ERA and an r of .40 for FIP seem surprisingly high. Given FIP’s slightly stronger relationship with exit velocity, a look at the components of FIP could shed some light on their relationship. The chart below shows the same groups from the graph above using proxies for the FIP components in strikeouts, walks, and home runs per nine innings (K/9, BB/9, and HR/9, respectively) depending on the average exit velocity. While walks and strikeouts never happen at the same time as a batted ball, it is possible that exit velocity might be some proxy for a pitcher’s stuff that would show up in strikeout and walk rates. Given the size of the sample, it does not look like exit velocity plays much of a role in the number of walks given up as it fluctuates by group and the r was a very small .15 between walks and exit velocity. Looking at the raw numbers, it looks like K/9 might have some relationship with exit velocity. The r is a little stronger at -.25, but when calculating FIP, that .5 difference in K/9 accounts for only a one-tenth difference in FIP. The strongest relationship among the FIP components is HR/9: the r is .34 and the data moves in a linear fashion. The .27 difference between the extreme groups makes a big difference in FIP, as it moves the FIP by roughly four-tenths. These relationships mirror the one between the FIP components and FIP itself, but with a much stronger relationship with FIP, as would be expected. Surprisingly, the correlation coefficient between exit velocity and FIP at .40 is roughly the same (.37) as walks and FIP. FIP is a very good statistic to use because it takes BABIP and defense out of the value equation. While pitchers do exhibit some BABIP skill, it requires a large sample to ascertain. In the case of defense, that’s simply not the pitcher’s responsibility. Attempting to tie a pitcher’s skill to BABIP suppression is incredibly difficult. We know that there is little to no relationship between BABIP and the Hard, Medium, Soft designations used on FanGraphs, and this data supports the notion that average exit velocity for pitchers and BABIP have almost no relationship. There is virtually no relationship between BABIP and home runs for pitchers this season, and there is also no relationship between BABIP and exit velocity for pitchers. If we were hoping to get closer to BABIP as skill, this data gets us no closer, and if we believe that suppressing exit velocity is a skill (which is up for debate), this actually lends support for the argument that pitchers have little control over BABIP. Don’t get me wrong… Statcast is a great thing, and we are only scratching the surface of what it can eventually become. The sample generated for this article yielded some benchmarks which will serve as the foundation for some analysis you will see here in the coming weeks. Still, when one is faced with a data set, one must put it into some sort of context, while acknowledging its limitations. In many of my previous articles here, I have warned readers to never take pure average velocity data at face value; launch angles, BIP type frequencies, pull percentages, etc., significantly affect hitter and pitcher performance, and can be easily be overlooked. For this year, at least, we should additionally be aware of the Statcast data set’s unique shortcomings, which adjust the context within which analysis takes place. So it seems like there might be some sort of relationship with production (FIP) and exit velocity, and most of this relationship is due to home runs, but this is where it starts to get difficult between what we have and what we want. We know that home runs are hit very hard. We know that limiting home runs leads to a lower ERA and FIP. In a small sample, it appears that pitchers with lower-than-average exit velocities succeed in limiting home runs as comparted to their brethren on the other end of the spectrum — and removing home runs from the seasonal exit velocities results in essentially the same exit velocities overall. What we really want to know is if lower exit velocities are a repeatable skill. If they are — and if we were able to solidify the link between those velocities and home runs — we could identify pitchers we might expect to allow fewer home runs in the future. We are not there yet. There is some indication that batted ball velocities are at least a portion of the pitcher’s responsibility and that they stabilize, but more research, more data, and more accurate data is necessary before we can get to the bottom of this. We hoped you liked reading Trying to Find Meaning in Exit Velocity for Pitchers by Craig Edwards! The Cardinals have been the luckiest team in Baseball with +11 wins over their BaseRuns. They are on pace to finish with a sub-90 win BaseRuns season. The Cubs and Pirates are both better teams when you take luck out of the equation. Yet Cubs and Pirates play one game do or die and Cardinals get a full series to get lucky again. Pirates will lose to Arrieta but still doesn’t make it fair for Cubs’ fans. Cardinals’ fans, your team is simply not good. All the numbers and all the smart people say so. Unless luck plays a role (as it often does), Cardinals will be a first round exit. What does any of this have to do with the actual article? Edwards noted Cardinals fan who favors Cardinals. OK. Makes perfect sense to me. You’ve taken a true point – that the Cardinals have outperformed their underlying event stats due to sequencing – and turned it into a silly, untrue point, saying that the team is “not good”. Going by baseruns standings here, the Cardinals are the 7th best team in the majors and 5th best in the NL. Baseruns put the Cardinals a whopping one game behind the Pirates and Cubs and half game behind the Nationals. The Mets are then one game back of the Cardinals, so baseruns basically says that the second through sixth best teams in the NL are basically equal by baseruns. The two teams that have most outperformed baseruns are the Cardinals and Pirates. Those two teams both have very good bullpens, so perhaps deploying top relievers in high leverage situations accounts for some – but not all – of that outperformance. Whatever the case, your “analysis” ends up as just a rant that lowers the intelligence of the discussion here. Meant to specify that the Cardinals and Pirates are the two teams in this group of NL teams that have most outperformed baseruns. Also, Cubs only at +3 wins over BaseRuns, whereas Pirates +6 tells you who has benefited from the least luck in the Central. Baseball Cardinals are happiest with + 11 victory BaseRuns. They have the pace to finish the season winning 90 BaseRuns. Bears and Pirates are the two best teams are happy when you exit the game. And again for the young and the Pirates play the game or dies and cardinals lucky again. Hacker takes Arrieta, and not fair to the fans, young. Not sure I understand everything you said. But if you’re saying we should go by BaseRuns to determine standings I must say I don’t disagree. The goal of the league should be to strip out as much luck as possible from the results. Seeding based on BaseRuns would ensure the best teams actually make the postseason every year. I hope that this comment is deliberate sarcasm or trolling, because it’s one of the most ridiculous ideas that I’ve ever read. Is that the best way to measure overall “luck”? Is there a reason not to factor in, say, luck regarding injuries? This is a team, after all, that lost their ace, third hitter, clean up hitter, starting center fielder, back up center fielder, and set up man for most of the season. Given that, are they the luckiest team in baseball? Doubtful. Well, fact is, everybody has to deal with a ton of injuries every year. Also, I consider the fact most of their production has come from nobodies like Pham, Grichuk, Piscotty, etc. while riding unsustainable performance to be luck. Pham, Grichuk, and Piscotty aren’t nobodies. 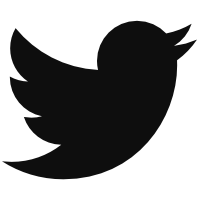 Did you reply in the wrong thread? There doesn’t appear to be any reason your comment is relevant to this article. He just likes to troll Craig Edwards because Craig also writes for a Cardinals site and he hates the Cardinals. So every time Craig writes an article or there’s one that says anything positive about any Cardinal or the team, he acts like a 3 year old who just had his lollipop taken away. Cardinals now at +12 wins of luck, and this after winning a game by four runs that with normal play they would have lost. Funny how when Sullivan and Lindbergh point out how lucky this team is, no one throws a fit like they do when I point it out here. Kind of incredible if you want to look at it this way – how often has there been a team that won 100+ games while actually playing like a sub-90 win team? Pretty incredible, I guess… er, enjoy the luck while it lasts, Cardinals’ fans. Were only a game behind the buccos in the Base Run standings, can you imagine if Bryant was on the team all year? CHAMPIONSHIP. If they fall short this season will be remembered as the year Theo’s cheapness cost the Cubbies the BAse Runs championship. The transition to BaseRuns from regular W/L might be easier than you think. I would still advocate for a playoff outcome structure based on regular W/L, with playoff seeding based on BaseRuns expected W/L Record. The NHL keeps track of points beyond regular W/L. So the system would be as follows – Keep track of Runs Scored v. Runs allowed and adjust for BaseRuns at the end of every Sunday evening in the standings. People may laugh but imagine even 10-15 years ago when people were being called idiots for using FIP to evaluate pitchers instead of ERA. Now we know how to compensate for luck in numbers, we have no need to keep using luck dependent numbers to evaluate teams. Why would you not want the best actual teams playing in the post season? Isn’t that the goal? By the way, by BaseRuns I think the Cardinals would miss the playoffs entirely, not even making the second wild card behind the Nationals. The problem with using BaseRuns is that it doesn’t eliminate all the luck out of the process. Players get lucky with ball and strike calls, hard hit balls get caught while soft hit balls fall in, all kinds of stuff. With the new Stat-o-Matic technology, we can eliminate luck by keeping track of batted ball velocity. Which ever team has the highest total batted ball velocity gets seeded the highest.